Keep beautiful bamboo looking its best for years to come with the right cleaning method. Thanks to a harvest time of as little as five years, bamboo is an environmentally sustainable, increasingly popular flooring choice. Its durability varies, depending on species and manufacturing processes: Natural solid bamboo is one tough customer, considered to be twice as hard as red oak, while carbonized or engineered bamboo can be as much as 30 percent weaker than natural, and more susceptible to wear and tear. Whichever type you choose, your floors will look great far longer if you learn how to clean bamboo flooring properly and care for it consistently. So protect your investment with these tips and techniques. Have a soft-bristle or fine-fiber broom accessible to keep bamboo in like-new condition. 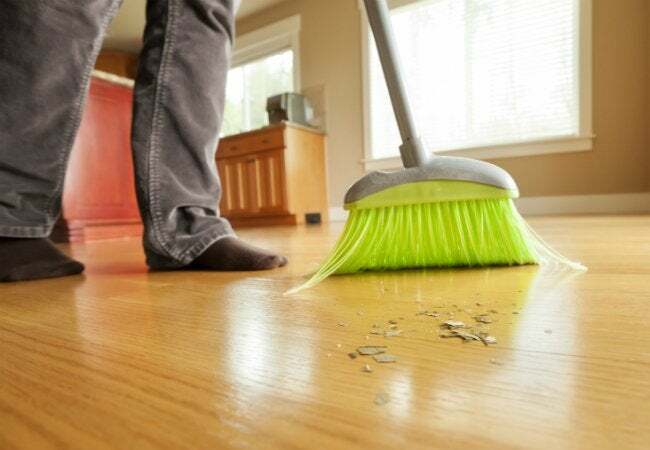 Without regular sweeping, ideally once a day, gritty dirt and dust can scratch the floor’s surface. Mop weekly, using a hardwood-rated cleaner like Bona (view on Amazon) or a wood soap like Murphy (view on Amazon) to maintain shine and protect the surface. 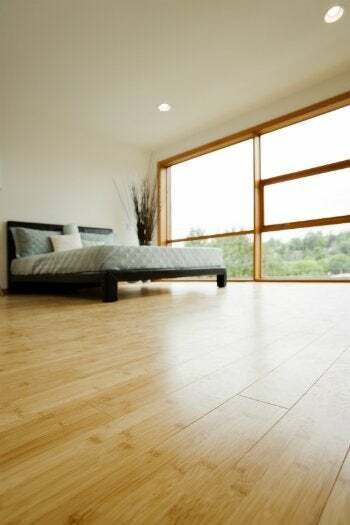 Avoid ammonia-, vinegar-, or other acidic-based cleaning agents, which can discolor bamboo floors or harm the finish, making them more susceptible to other damage. If the manufacturer’s instruction specify dilution with water, do not over-dilute. Thoroughly wring your mop to ensure that it’s just slightly damp and avoid any pooling liquids on the floor. Excessive moisture from either extra watery cleanser or sopping wet mop may get trapped in cracks between planks, where it can cause expansion, cupping, or buckling. Finally, do not apply wax or any finishes that are not recommended by your floor manufacturer. Stave off damage from ordinary accidents by sopping up any spills immediately with a soft, dry cloth. Then, clean bamboo flooring with a fresh rag, lightly dampened with water, and dry if any water remains. If you’ve laid bamboo in a kitchen or bathroom, it’s highly recommended to place a rug around the sink and counters, where spills are likeliest to occur. Just be sure it’s a breathable material, without a latex or rubber backing, which can discolor or damage bamboo. Should you not be able to save the bamboo from stains, removal must be approached on a case-by-case basis, depending on the source of the stain, the variety of bamboo, and whether the stain has affected the finish or has sunk into the wood. Using the wrong removal agent could worsen the problem; fortunately, many bamboo floors can be refinished, so a stain can be properly treated at that stage. Some water stains or discolorations can be successfully treated with a dollop of real mayonnaise. Let it sit for at least 15 minutes, then wipe off and polish with a soft, clean rag. If the oil-rich mayo doesn’t do the trick, it shouldn’t make matters worse; however, various other “remedies” you might see online have potential to harm bamboo flooring, so proceed cautiously. For scuff marks from heels, simply apply some wood floor cleaner to a rag (diluted as required) and gently rub. Spot-dry when finished and it should look as good as new. Once you’ve done all you could to clean bamboo flooring, these preventative measures will keep your bamboo looking beautiful for years to come! • Trim pets’ nails fairly short. • Make bamboo floors a barefoot or stocking feet zone. The soles of street shoes can trap fine pebbles that can scratch floors. • Put colorfast felt or other soft pads under all chairs and other furniture. No scraping means no scratching. • Maintain a relative humidity of 30 to 50 percent in your home. Excessive humidity for a prolonged period can cause swelling, whereas too little humidity can lead bamboo to dry or crack. • Never use rubber- or latex-backed mats, which can trap moisture against the flooring and cause damage or discoloration. • Stiletto heels and sport cleats can wreak havoc on bamboo floors by leaving indentations. This is especially true of carbonized bamboo, which is 30 percent softer than natural bamboo. • Avoid keeping furniture and rugs in the same spot for years, as sunlight can fade bamboo over time. Instead, change your floorplan now and then, or better yet, use curtains or blinds to filter or angle sunbeams. • Never, ever steam-clean your bamboo floor.